½ cup soft dark brown sugar, loosely packed. 1. Mix flour, baking soda, cornstarch and salt in a bowl. Do not sift the flour. 2. In another bowl, whisk melted butter, brown and white sugar until sugar dissolves. Please ensure that the butter is in liquid form at room temperature - and not simply softened. The darker brown your sugar is, the darker your cookies will be. 3. Add the egg and egg yolk into the butter mix, and whisk lightly until creamy. Whisk the vanilla extract in. 4. Pour the wet ingredients into the dry ingredients and mix together with a wooden spoon or spatula. The dough will be very soft, but eventually will come away clean off the edges. 5. Add in the 1 cup of chocolate chips, and fold in. They may not stick well to the dough, but give a good stir until they are just about dispersed throughout. 6. Preheat your oven to 170 deg C. Meanwhile, just leave the dough in the fridge to cool slightly. 7. Shape the dough into small balls (I used a cookie scoop) and space out evenly on the baking tray. Make sure to leave space between each ball and from the edge of the tray. Put a few chocolate chips atop each mound. They will be underbaked, but do not bake longer than 12 minutes. 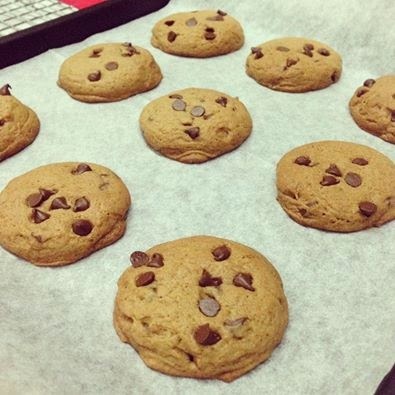 Doing so will result in non-chewy cookies! Allow to 'rest' out of the oven for 15 minutes (do not transfer to a cooling rack as yet) where they will continue to cook on the baking tray. Once they are sufficiently cooled, transfer to a wire rack to cool completely.